This is the first in a series outlining my rules, principles or "commandments" about how to be a healthy foodie. Please note that my version of "healthy" is not extreme nor all that strict, because I'm also a committed foodie--someone who loves to eat (and to shop, cook, dine out, drink wine -- the works). If you have watched "Food, Inc." or "Fresh," read Michael Pollan's Omnivore's Dilemma or some of his other books, you know that our nation's industrial food system is terribly unhealthful and environmentally irresponsible. One of the worst offenders is how we raise, slaughter, distribute and consume meat -- not just beef and pork, but also poultry and seafood. Second, I will not buy meat or poultry at the supermarket, and I'm also very careful about where I buy fish. When possible, I buy meat and poultry from local farmers who raise their animals naturally and handle their products with extreme care. I welcome and encourage comments and suggestions about how to cope with and ideally to change the industrial food system. Meanwhile: no supermarket or fast-food meat, healthy foodies! 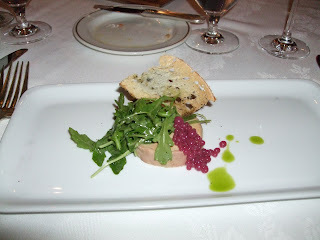 We introduced two of our foodie/wine-loving friends to the hidden gem in town called the Summit Restaurant. It's the fine dining establishment connected to the Midwest Culinary Institute at Cincinnati State College, a neighbor of ours here in Clifton. If you're not familiar with this excellent dining option, you really ought to check it out. The Summit serves dinner Thursday - Saturday under the guidance of professional chef Matt Winterrowd, assisted by top students from the culinary school. We went on an extra-special evening when our city's top chef participated in the kitchen by contributing one starter and one entree to the already-enticing menu at the Summit. While Jean-Robert de Cavel gets his new downtown eatery ready to open later this spring, it was a wonderful treat to partake of his cooking--and his delightful personal presence after the meal. Above are photos of some of our choices. My personal favorites were the stellar lobster duo (top photo), J-R's appetizer of lobster salad next to a cup of lobster bisque. It was even better than it sounds, thanks to Chef's inventive touches. 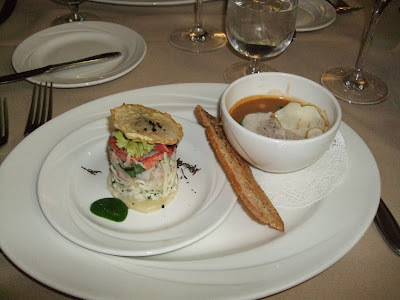 I love how he selected common ingredients for both the salad and the bisque -- such as apple, watercress or black truffle -- and yet produced two distinctive but complementary taste sensations. As far as I could tell, most diners found this treat as irresistible as I did, along with two of the three accompanying me at our table. Our entrees included Chef de Cavel's rich beef and bison preparation with a complex red wine/chocolate sauce and Chef Winterrowd's red snapper preparation. Both got oohs and ahhs from my companions. Finally -- dessert. The chocolate one (second from bottom) was a hit at our table, but it's the final photo of my coconut cloud (I think it was called) that was my second-favorite dish of the night. 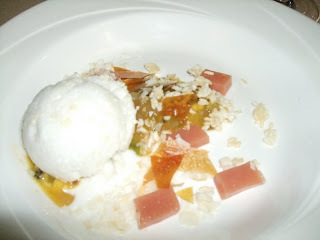 I could eat that every night: very light coconut ice cream -- more like ice milk or granita -- with crunchy basmati rice and tropical fruits. 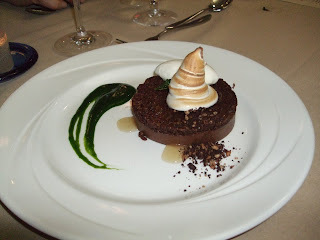 It was not too sweet, not too rich and a positively perfect finish to a marvelous meal. 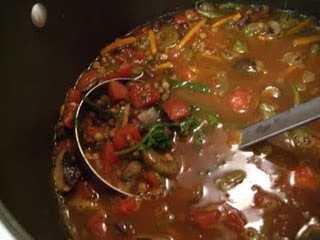 I've adapted this soup recipe from another of my favorite healthy-foodie sources, the Berkeley Wellness Letter. Although I've subscribed to the hard copy for years, you can also find a lot of good health related info on their website. 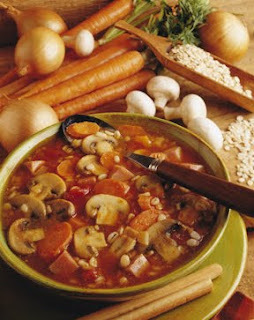 This soup fits my ideal for virtually all my cooking, or at least my everyday cooking: the result is so tasty that you lap up every spoonful, and you don't feel guilty about it because the ingredients are so healthy. Heat oil over low heat in a large saucepan. Add onion, garlic and carrots. Stir frequently until veggies are tender, about 6-7 minutes. Stir in the mushrooms and cook 3-4 minutes. Add tomatoes, barley, liquid smoke, salt, thyme and water. Increase heat to medium-high and bring to a boil. Cover, reduce to low heat again and simmer for about 30 minutes. Add pasta, cover again, and cook until the pasta is done, about 10 minutes. We like sweet potatoes WAY better than other types of potato. Even if they didn't pack their beta carotene and Vitamin C punch, we'd love sweet p's for their delicious taste. Regular potatoes, at least in my opinion, need so much more caloric enhancement than their orange cousins do. 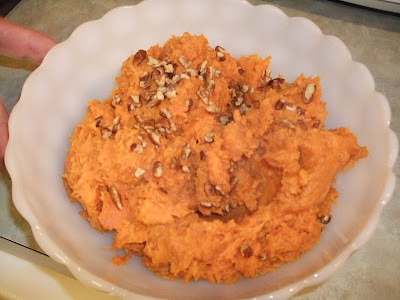 While both veggies are amazingly versatile and very healthy (unless deep fried in oil or loaded with butter and cream), sweet potatoes get the edge in my kitchen. I'll often cut a couple of large ones into chunks, toss with olive oil and seasonings and roast in a hot oven until tender but still toothsome. A little more work but worth the effort is to peel, cut and steam them until very tender before mashing with a little milk, oil or no-trans-fat margarine and seasonings of your choice. For the version pictured above, I added a dash each of cinnamon and cayenne pepper, then sprinkled liberally with chopped pecans. Whole grain foods make great side dishes, or even main courses studded with vegetables and additional protein sources such as shellfish, chicken or cheese. One very versatile grain is quinoa, which also has the benefit of being quick-cooking. It takes about 15 minutes to cook. From there, you can serve it hot or cold, all kinds of ways. My favorite food magazine, Eating Well, features several quinoa recipes on their website this week. 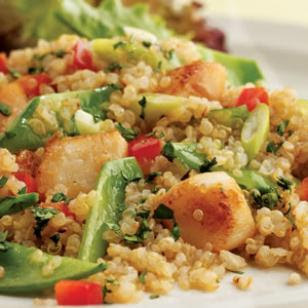 Here's a marvelous quinoa dish--pictured above--that combines delicious scallops with crunchy snow peas and red bell pepper. Search the site for additional ways to enjoy this healthy ingredient! This cake is delicious with your morning coffee or tea, and also makes a nice dessert with a scoop of vanilla frozen yogurt or low-fat ice cream. It's chock-full of healthful ingredients, such as whole-wheat flour, pumpkin, carrots and nuts. For a sweeter loaf, add the dried cranberries and increase the sugar to one cup. If desired, substitute other nuts you have on hand, such as chopped walnuts or slivered almonds. Chocolate chips make a nice addition, too.If you don't have whole-wheat flour on hand, it's OK to use white flour instead. Preheat the oven to 350 degrees. Spray a 9-by-5-inch loaf pan with cooking spray. In a large bowl, blend flours with next five ingredients (through salt). Add pumpkin, oil, egg and egg whites, carrots, nuts and cranberries. Stir until evenly blended. Spoon batter into loaf pan and bake for about 45 minutes, or until toothpick inserted into center comes out dry. Cool in pan for 15 minutes, then invert on rack to complete cooling. You have to go pretty far south to find farms in their growing season, but that doesn't mean there's nothing to buy at your local farm markets. Admittedly, Cincinnati's historic Findlay Market is not your typical seasonal tailgate market. And yet there are a surprisingly robust number of markets that have found indoor places to hold winter markets. At Findlay, there even are some hardy souls hanging outdoors at the farm shed on Saturdays, selling pastured meat and eggs or orchard apples from their trucks. 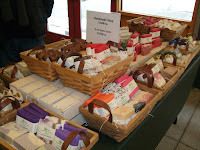 Now that we're in a February thaw, the number of shoppers at the market has picked up, especially on Saturday. 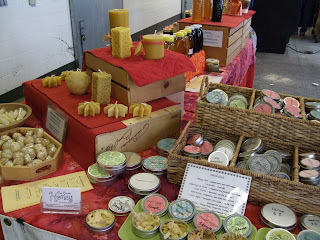 In addition to the fish, meats, prepared foods, cheeses, teas, coffee and wine/beer available in Findlay's indoor areas, you'll also find locally made foods, jewelry, soap, baked goods and all manner of other treats even in the dead of winter. 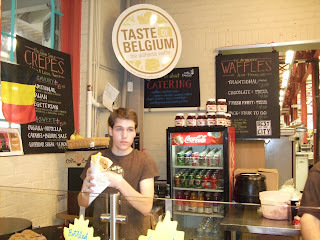 I always like to get lunch there, too, and can't seem to get past the terrific vegetarian crepes at Taste of Belgium. Here are some photos from a Saturday visit. The market is open Tuesday through Sunday in all weather except a Level 3 Snow Emergency, which has not occurred (thank the Lord) in recent years. 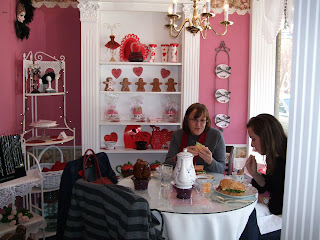 Paula Gallo-Knight owns Mrs Teapots Tearoom, where she serves a light menu to go with a wide selection of (mostly) flavored black teas. She's serious about tea, using loose-leaf rather than teabags, in dozens of china teapots she has collected over the years. Her restaurant, open Tuesday - Saturday, has been in business almost 5 years on an interesting stretch of Fairfield Ave. in Bellevue. Her daughter also recently opened a cupcakes/cake shop just a few doors down from Mrs Teapots, so don't miss that if you are in Bellevue. Until recently my only knowledge of Bellevue was Party Source, but the little burg has gotten a few new restaurants of note including Virgil's and Bellevue Bistro. 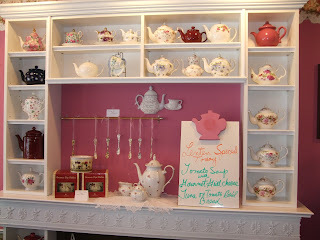 There are antiques shops and a boutique or two, as well, making it an up and coming retail neighborhood in metro Cincinnati. 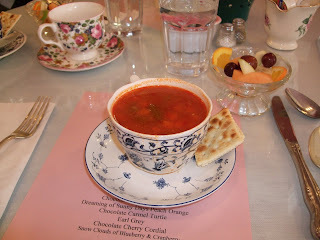 I'm writing about Mrs Teapots for the Cincinnati Enquirer's "Under $25" column which is likely to be published on 2/26, so I won't go into detail here about our experience at the tearoom. B-sprouts are one of my go-to veggies, and not only because of their healthy profile but also because with the right preparation, they taste great. For a complete nutritional breakdown detailing the vitamins, antioxidants and dietary fiber that these veggies bring to your table, go here. You can get Brussels sprouts year-round but they're actually best in fall, winter and early spring -- their peak growing season. The easiest prep is to trim off the stem ends, slice them in half (or thirds if they are larger than a walnut) and steam until tender. Then toss with a low-fat sauce or dressing of your choice. The recipe below takes these babies to another level by steaming first and then caramelizing in a frying pan on high heat (top photo) before adding a little pesto (finished product, bottom photo). Serve as a side dish with fish, poultry or a vegetarian entree. Place sprouts in a steamer and set in a saucepan. Add 1/2 cup water, sprinkle with salt and cover the pan. Bring water to a boil, then reduce to low heat and steam until sprouts are just becoming tender. It will take about 4-5 minutes depending on the size of the slices. Test with the point of a knife; when the center of one of the sprouts yields to the knife, they are ready. 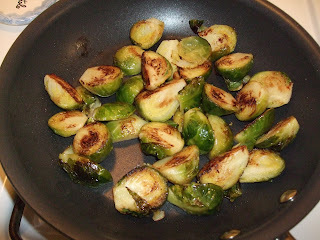 Be careful not to overcook -- sprouts should still be a bright green color. Immediately rise the sprouts in cold water to stop the cooking. Drain well. Heat a nonstick skillet over high heat; add the oil. Place the sprouts in the pan and cook without stirring for 1-2 minutes, allowing one side of the sprout to turn a golden brown. Turn sprouts with tongs and brown the other side. 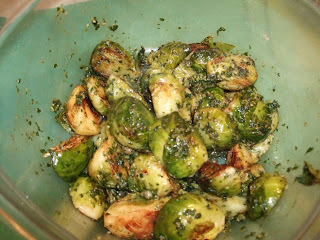 Remove from heat and toss with the pesto sauce. Heat oil in a large skillet over medium heat. Add sausage and cook, stirring, until sausage begins to brown, about 4 minutes. Stir in garlic and cook another 1-2 minutes to coat garlic with oil. Add tomatoes and oregano, Cover and cook until tomatoes begin to release their juice, about 3 minutes. Add broccoli, olives and stock or water, stirring well. Season with salt and pepper, cover and let heat through, about 2 minutes. Stir in pasta, adding more water or stock if the mixture seems too dry. When dish is hot, remove to a large bowl and serve immediately, passing cheese at the table. This combination of flavors pairs well with many types of wine, both red and white. We poured a light-bodied Cabernet Sauvignon that we liked fine with it, although that's an unorthodox choice. I got this idea from the marvelous new Rick Bayless restaurant in Chicago, Xoco, where I had a simple salad with dressing that was so remarkable, I asked the chef for her recipe and whether I could bring a bottle of it home. She told me the ingredients but said it's so perishable that they make it fresh every day--alas, not possible to bottle the stuff. To accompany our Valentine's Day dinner (main dish recipe below), I tried to approximate Xoco's dressing on a broccoli slaw base. At this time of year, however, they didn't have cilantro at the market so I had to substitute parsley, which affected the results. Also note that you can adjust the liquid ingredients (half & half, olive oil) to make the dressing more or less thick. For instance, if you want to serve it on lettuces, it would be better at a thinner consistency. In a food processor, puree two-thirds of a very ripe avocado with the juice of one lime, a handful of parsley or (preferably) cilantro, 2 T fat free half and half*, 2 T olive oil, a sprinkle of garlic powder, salt and pepper. When smooth, taste for seasonings and adjust as needed. Note: Sour cream would be ideal here, but I didn't have any on hand. A reader busted me in a comment about using fat free h&h, saying it's "chemicals." If anyone knows an acceptable (& healthier) substitute for the stuff, especially that will taste good in my hot tea and coffee, please post a comment. Place one package broccoli slaw in a large salad bowl. Stir in 1/2 red bell pepper, cut into small strips, and 1 T rinsed capers. Pour dressing on salad and toss well. When serving, slice the remaining avocado onto plates. 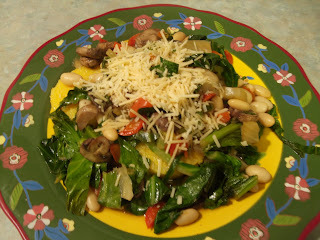 For a special Valentine's Day dinner (on Sunday), I made this recipe. It came out so well, we vowed to have shellfish at home more often. It's crucial not to overcook scallops or they become rubbery, and that danger has made me wary of trying--what if I ruin these expensive babies? But with extra care, they came out perfect. 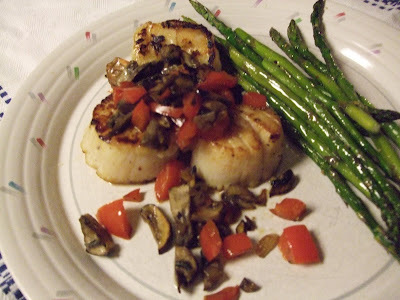 A couple of tips: buy large scallops, which will be much easier to get right -- their thickness makes it less likely that you'll overcook them. I also bought a couple of jumbo shrimp (is that an oxymoron?) so that they stayed tender in my frying pan, too. Rather than make a rich cream or butter sauce, I simply sauteed chopped mushrooms, red pepper and shallots in a little olive oil. I removed the veggies to a bowl, cooked the shellfish, and when the shellfish were on the plates, put the sauce back in the pan on high heat for a minute. We had roasted asparagus -- my husband's favorite vegetable, a treat for him on Valentine's Day even though it's out of season and came from Peru. 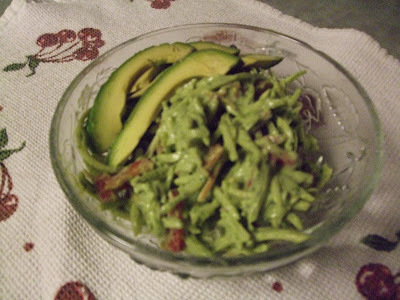 I also made a lovely salad with avocado dressing, which I'll be posting soon. Heat a nonstick skillet over medium heat and add 1-2 T of oil. When pan is hot, add vegetables (mushrooms through pepper) and stir-fry until veggies are tender, about 3-4 minutes. Remove veggies to a plate, cover and keep warm. Raise heat to high. Add remaining oil. Sprinkle shellfish with salt and pepper and using tongs, add one at a time to the pan. Be sure not to overcrowd the pan -- fish should not touch each other. Allow scallops and shrimp to cook on high heat until they are golden brown, about 2-3 minutes depending on the heat of your pan and the thickness of your fish. Turn and brown the other side. Total time in the pan should not exceed 5 minutes. Sprinkle with the lemon juice and remove fish to serving plates. Immediately return sauce to the pan and stir quickly until heated through -- only another minute. Pour over fish and serve. The first courses may have been our favorites. 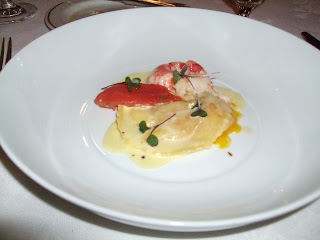 Mine was heavenly: Butter poached Maine lobster, bottom photo (what's not to love about that?) with ricotta cheese and organic egg ravioli. My Valentine and dear husband of 15 years had seared tuna with a potato crust, accented with bits of house cured bacon and a Brussels sprout salad. We both had a fish dish for our third course, sand dabs, which we found underwhelming. We also both ordered duck breast next, with braised cabbage pierogis (that didn't work for me), cipollini onions (very tasty) and a little spinach. Finally, we enjoyed French press coffee with a dessert duet of frozen passion fruit souffle and chocolate bete noire. Along with a variety of wines, this was a food and wine blowout in a lovely setting, perfect for Valentine's Day....but not likely to be repeated anytime soon, for obvious healthy-foodie reasons! 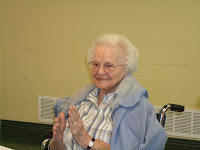 Today (Feb. 12th) is the birthday of Abraham Lincoln, Charles Darwin and my mother, Wilma Mason. 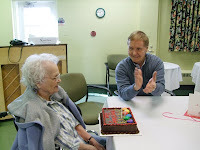 She lives a mile and a half from our house among the kind, caring staff at Scarlet Oaks Retirement Community. Today we staged a party for her! 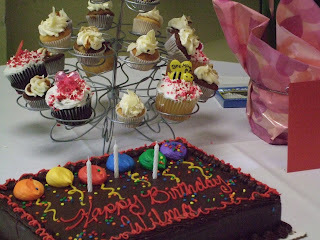 I brought a delicious sheet cake -- yellow cake with chocolate icing, the best basic combo -- from Servatii's Bakery, supplemented by an amazing assortment of mini-cupcakes from Take the Cake bakery. In addition to many of her friends and staffers at Scarlet Oaks, my husband dropped in to wish her well. 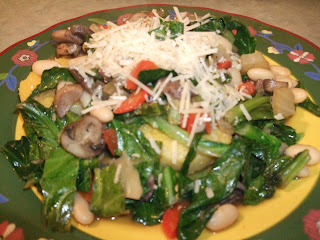 Here's another simply delicious vegetarian meal that's chock-full of vitamins, nutrients and fiber. The recipe will serve two as a main dish--over polenta, pasta or rice--or 4-5 as a side. We had it over polenta, but you can't see any of it in the photos as it was completely buried under the veggies and beans. Heat oil in a large, deep skillet over medium heat. Add chopped fennel and red pepper. Cook, stirring often, for 2 minutes. Cover and continue to cook until vegetables begin to tenderize, about 3 more minutes. Stir in mushrooms and garlic. Cover and cook for another 3 minutes. Season with salt, pepper, cayenne and cumin, stirring well. Stir in broth and greens. Cover, reduce heat to low and simmer until greens have wilted, about 5 minutes. Add beans, cover and cook just until the beans are heated through, about 3 minutes. Remove from heat and serve, passing cheese at the table, if desired. In my 'hood -- Gaslight Clifton--there are several places for coffee and pastry, each with a distinct ambiance. Sitwell's has the boho feel of a throwback to the 1960s, Bruegger's Bagels fronts Clifton Avenue and Burnet Woods, Brutopia is a bit more serious about their coffee drinks and has a hole-in-the-wall, away from it all feel. The most recent addition is Om Cafe, across the street and a few doors down from Sitwell's--or across from the fantastic Esquire Theater, if you're not a Cliftonite. Here you can browse books about New Age spirituality* and chow down not only on pastries but also on healthy salads and sandwiches. 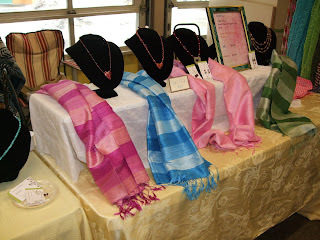 *Om Cafe is within the Aquarius Star store. 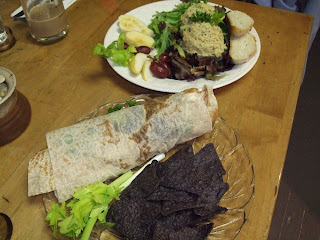 Pictured here, a Lebanese wrap (something unique, thanks to the ethnic background of the family that owns the place) and a salmon salad. 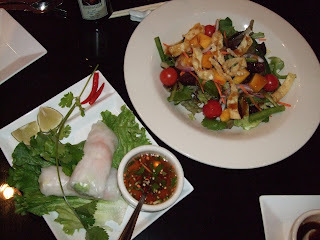 My husband and I made our way to Suzie Wong's in East Walnut Hills this weekend, and wow, were we impressed. Much of what passes as Chinese--or Asian--food in this town is greasy, heavy and unimaginative. With a few exceptions, it's like they're all drawing from the same sloppy kitchen. But Polly Campbell's four-star review in the Cincinnati Enquirer last month promised a vastly better dining experience. As we perused the menu, we asked our server to help us find the healthiest food in the house, which seemed like a request she didn't get that often. But she good-naturedly guided our selection from among an extensive but not overwhelming array of appetizers, salads, noodle and rice dishes and entrees. His entree came from the Noodles section, Wong's version of Pad Thai ($8.95, middle photo)--frankly, not a dish I usually would recommend because most renditions are piles of too-salty noodles so oily that the food practically slides off the plate. 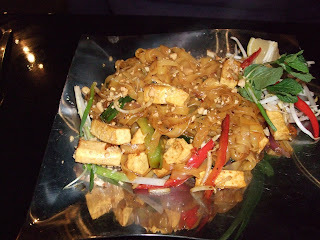 But this Pad Thai was exemplary, studded with crispy veggies and the steamed tofu he chose for protein (it could have been chicken, beef or shrimp for that price, a little more for duck breast or "seafood supreme") --and his empty plate didn't glisten at all. I took our server's recommendation and tried the Wild Mushroom Trio ($12.95, bottom photo) from the Veggie Corner section of the menu. The description ("sauteed fresh shiitake, oyster and enoki mushrooms in a ginger white wine sauce on a bed of seasonal vegetables") doesn't even hint at the magnificence of this dish, at least to my taste. (Owner Alex Chin walked by as I was digging in and commented that I was eating his favorite dish in the house.) As with most of the entrees, the mushrooms came with a side of white or brown rice, but I didn't want it--the main course was just so perfect as is. What was so great? Perhaps most notable was the tender meatiness of the 'shrooms themselves, especially the shiitakes, which had an ethereal taste and texture. 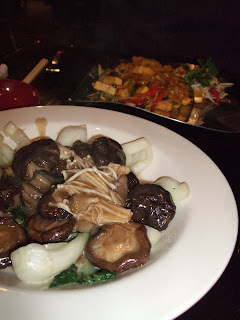 The veggie combo with the mushrooms was delightful, too, including baby bok choy and the unusual lotus root, while the mild ginger sauce pulled it all together very nicely. No liquor license yet at Suzie Wong's, which suits us just fine as bringing our own wine helps to keep the tab down--we brought a bottle of very nice Oregon Pinot Noir that set the food off perfectly. That situation won't last forever as the restaurant has applied for a liquor license--when they get it, manager Bill Hatfield says they'll stay open a lot later and serve interesting cocktails as well as beer and wine. Now that's something to look forward to....along with many lunch and dinnertime visits to try more of the amazing food. 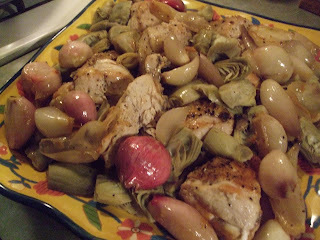 From the great food author Elizabeth David's classic book "French Provincial Cooking," her chicken sauteed with shallots and artichoke hearts used to be in my repertoire, especially for company. 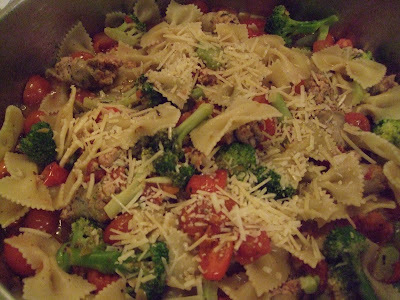 (It was the first meal I cooked for the man who became my husband, it so happens.) But it calls for a whole chicken, cut up (with skin and bones), along with 6 tablespoons of butter. It had dropped out of my repertoire some years ago. This weekend I resurrected it for a dinner party, but used breasts only -- with a little skin left on for flavor -- and substituted canola oil for the butter, and not cut back to four tablespoons. We also had a vegetarian entree (two of our guests were not meat-eaters), so I had the butcher cut the large chicken breasts in half. If the chicken pieces are large, this recipe easily will serve six. One more note: look for free range chicken raised humanely, hormone free, and no water added to the meat. It's not easy to find this kind of chicken, and you're never really sure what you're getting, no matter what the label says. I bought mine at Whole Foods, where the head of the meat department assured me that "all our chicken is free-range." Wash the chicken pieces and trim any visible fat and extra skin. Dry thoroughly with paper towels. Heat 3 T of the oil in a heavy skillet over medium-high heat. Brown the chicken--a few pieces at a time, if necessary (don't crowd the pan)--on all sides, starting with the skin side down. When the pieces become brown, remove to a plate and tent with foil. Add the shallots to the pan and stir well as you cook them. When they start to brown, return the chicken to the pan. Season with salt and pepper, lay the bay leaves on top and cover the pan. Reduce the heat to medium-low and cover the pan. Every 7-8 minutes, spoon the pan juices over the chicken. Meanwhile, heat the remaining 1 T oil in a smaller skillet. Add the artichoke hearts and stir well. Season with salt, cover the pan and cook over low heat for 8-10 minutes, or until the hearts are tender. After the chicken has cooked about 15 minutes, remove the pieces from the skillet and arrange them on a platter with the shallots and artichoke hearts. Discard the bay leaves. Pour the chicken stock into the large skillet and boil over high heat, scraping the pan drippings. Boil for a couple of minutes until the stock reduces to about 1/3 cup. Pour over the chicken and serve at once. Let me say up front: I am not a baker. My mother had the knack--pies were her specialty--but I've never become adept at using the oven. But on the relatively rare occasions when I've been housebound due to weather, something compels me to dig through my cabinets, pull out the ingredients for oatmeal cookies, and bake up a batch. I just used the recipe from the oats box. If the idea appeals to you, here's what Quaker Oats' website now posts as their Famous Oatmeal Cookies recipe. To the best of my memory, this is the one I used to make--in those days, using Crisco, which I now know to avoid due to its heart-unhealthy trans-fats. (Quaker now says to use vegetable shortening made without trans-fats.) The batter tastes as good or better than the baked cookie, but it's dangerous to eat raw eggs so beware of dipping your finger too many times into the mixing bowl. While the cookies are cooling, go out and shovel your walkway to counteract the calories you're going to consume. In large bowl, beat brown sugar, shortening and granulated sugar on medium speed of electric mixer until creamy. Drop dough by rounded teaspoonfuls onto ungreased cookie sheets. Bake 9 to 11 minutes or until edges are golden brown. Remove to wire rack. Cool completely. Store tightly covered. Note: Improve the final product by adding 1/2 cup of raisins, golden raisins and/or chocolate chips to the batter before dropping onto the cookie sheets. Grapefruit and orange are still at the peak of their season, and fennel (also called anise) also peaks in winter. Now is the perfect time to make this delicious salad. A generous sprinkling of toasted, chopped nuts adds monounsaturated fat--the healthiest kind! 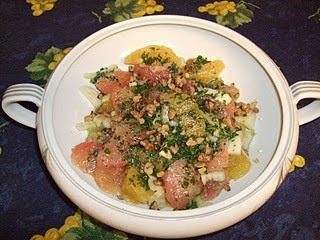 This citrus and fennel salad would make a lovely contrast to the lentil soup, below. I'd serve the salad as a first course, then follow with this or another soup or a hearty stew. It looks like much of the Midwest and Northeast are in for a snowstorm this weekend. Before the stuff hits, be sure to pick up the ingredients for this hearty soup. My favorite grocer, Trader Joe's, sells cooked lentils in their refrigerated-produce section. Using them makes the soup come together really fast! This is the most-emailed article on today's New York Times website--an article by health writer Jane Brody that summarizes Michael Pollan's most recent book, Food Rules. Great advice for our personal, our society's and our planet's health. Looking for a hearty, one-pot, crowd-pleasing meal to have on Sunday? 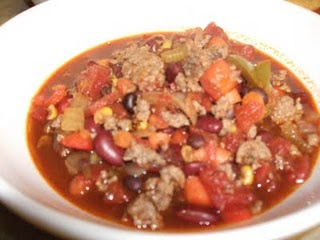 Try this chili recipe that uses a lower-fat red meat, plenty of veggies and beans, and it's all enhanced with a bottle of dark beer--the darker, the better. Be sure to have some of the same brew on hand to drink with the meal, along with lighter beers for those who prefer them. Bison contains significantly less fat and saturated fat than beef (or any other meat, for that matter), and it adds a similar flavor to chili, spaghetti sauce, and so on. With two kinds of beans and a little cheese on top, this is a protein powerhouse. Serve over rice, with corn chips or (my favorite) cornbread. Pass a bowl of grated jack or cheddar cheese at table. Mediterreanean foods -- eat more of these! Here's a list of nine foods that are staples the mega-healthy Mediterranean diet and that we should all be finding ways to include on our own tables. They include some of my favorite ingredients, most of which are easy to find and prepare. The list is adapted from an article in Eating Well, one of the best food mags out there. 1. 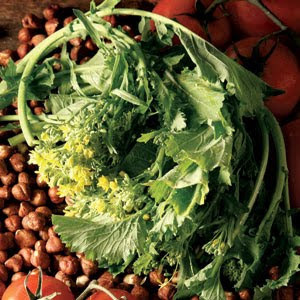 Broccoli rabe (also called rapini) -- an Italian green (pictured, right) that's loaded with vitamins and antioxidants. To remove any sharp bitterness, blanch a coarsely chopped bunch in boiling water for a couple of minutes, drain and saute in 2T canola oil with a bit of minced garlic added right before you take the pan off the heat. Serve as a side dish with grilled fish or meat, or toss with pasta. 2. Chickpeas (garbanzo beans) -- if you eat hummus, you're eating chickpeas. They're also good on salads or added to cooked veggies or soups. Just be sure to drain and rinse the canned beans--as you would any canned beans--to remove excess salt. 3. Couscous -- whole wheat versions are the healthiest, and the big bonus here is in convenience. No cooking required--just soak in boiling water -- or follow package directions. 4. Eggplant -- an amazingly versatile veggie, can be prepared a thousand ways. Just search the 'Net until you find a recipe you like. 5. Hazelnuts -- though most nuts will substitute. You should eat some nuts every day, really. 7. Peppers -- green, yellow, orange, red or purple, they're good raw or cooked. These are even more versatile than eggplant. I eat raw orange pepper slices literally every day--they make a convenient, tasty and super-healthy snack. 8. 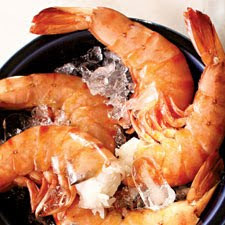 Shrimp -- but almost any seafood will suffice. Try to eat fish at least twice a week. 9. Tomatoes -- out of season, go for the canned variety, although I've been trying to find them in other containers after hearing how bad the can-liner substance BPA is for us.